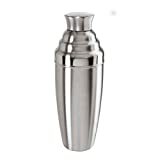 With innovative designs and contemporary finishes, Oggi’s kitchen and bath wares are truly tomorrow’s housewares .Oggi’s Jumbo Party Stainless Steel Cocktail Shaker is no exception. Perfect for parties, entertaining or just around the house. Mix up your favorite cocktail just like they make it at your favorite “watering hole-inch . and, with this extra large shaker, you can super size your drink concoctions for all of your guests. Contemporary and sophisticated design. Also features a built in ice strainer. 60 ounce capacity. Stainless steel shaker and lid.